Place the chocolate and coconut oil in a microwave safe bowl. Microwave in 30 second increments, stirring thoroughly between each, until the chocolate is completely melted (do not overheat). 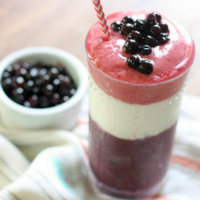 Place the frozen Wild Blueberries, frozen banana chunks, kale, milk, matcha powder, and honey in a blender. 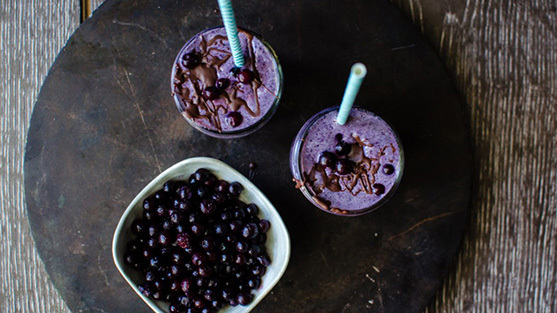 Drizzle the chocolate into the blender and reserve a little for the very top of your smoothie. Blend for about 15 seconds to incorporate the chocolate. 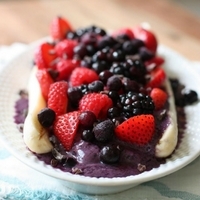 Divide the smoothie into two glasses and drizzle the remaining bit of chocolate on top.